Who, I ask you, doesn’t love dinosaurs? Nobody! That’s why National Geographic Kids’ latest picture book, Ultimate Dino-Pedia: The Most Complete Dinosaur Reference ever is such a timely reference. This book is full of, well, everything. From the Table of Content (TOC) to the Foreword to the Indices in the back, this book is chock full of pictures and information about long-extinct dinosaurs and the present-day, still-alive-and-kicking paleontologists who love to study them. Readers learn what dinosaurs are (or in this case, what they were), and the differences in classifications, like Ornithischians versus Saurischians. There are amazing illustrations of gigantic dino’s running loose in their natural environment — which readers learn, were mostly marsh lands and murky rivers. There are thrilling page turns that outline dino habitats along shore lines, deep inside lush forests, and across sandy deserts. There are photos of dino courtship and mating rituals, fossilized dino eggs, herd migration habits, and dino predators. This is a thorough and meticulous book that is filled-to-bursting with amazing illustrations by Franco Tempesta that show dinosaurs fighting, biting and swinging spiked tails at the enemies. There are winged mutant dinosaurs attacking ostrich-like fleeing dinosaurs; lizard-like dinosaurs giving cone-headed dinosaurs the side-eye; and every other type of dinosaur you can imagine. National Geographic Kids’ tried to think of everything with this book. 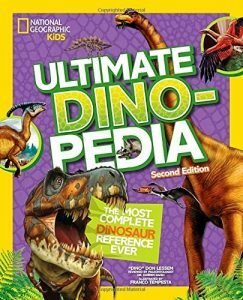 There is a convenient and much-needed section on “How to Read this Book; a Dino-Glossary and also a section that recommends books, websites and videos that can enhance readers’ dinosaur experience. There is also a section that suggests actual places to visit to get yourself into the “dino spirit.” There are several visuals, including the Triassic, Jurassic and Cretaceous Periods and various “dino measurements” to help readers visualize sizes when dinosaurs are mentioned.